Former New York Rep. Major R. Owens may not have known he had an intern who was going places when he assigned college student Yvette D. Clarke to work on trade legislation in the mid-1980s. Clarke was studying government and public policy at Oberlin College and was eager to learn more about the mechanics of Congress. About two decades later, she ended up challenging Owens in a 2004 Democratic primary — and lost. When Owens retired two years later, Clarke ran again — and won. Just this week, the House passed a bill to redesignate a post office in Brooklyn after Owens, who died in 2013. Clarke had introduced the legislation to honor her former boss. Q: What did you do as an intern? A: It was a brief internship when I was at Oberlin College. My job was to work on the Caribbean Basin Initiative, which was a sort of trade agreement in the ’80s that looked at how the United States could work with the Caribbean region in a mutual agreement around trade … and really building a bridge between the United States and the Caribbean region. That was of interest to me because my parents are from the Caribbean. They’re from the island of Jamaica, and that was a huge initiative for so many who lived in my community, who were also from that region. [I did] the research, looking at the congressman’s role and ways in which he could strengthen and look at new provisions within the initiative to again strengthen those bonds. A: I was excited about coming to Washington, D.C., because I’d visited — [took] Smithsonian tours — but to be in the halls of Congress during a time where I could make a difference was really something that I treasure. [I’ve] also been an intern at the state [level] for two state legislators in New York. Sen. Velmanette Montgomery, I worked in her district office, so that gave me a real lens into how governmental offices of elected officials deal with day to day, nitty-gritty concerns of constituents. I also served as an executive assistant and driver for Assemblywoman Barbara Clark, who is now deceased. That was a very unique experience because I got to really know the member extremely well … driving her between Albany, New York, and Queens, New York. 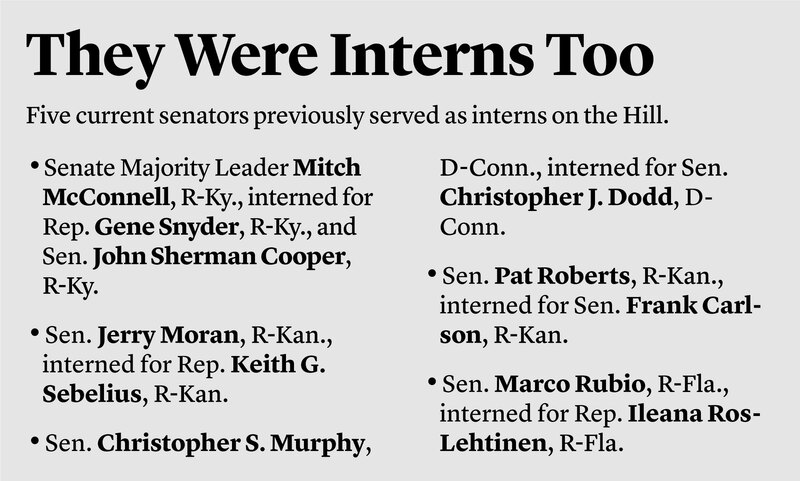 Q: How have internships on Capitol Hill changed? A: There hasn’t been that much of a change. It really is up to the interests of interns who are coming, the areas of expertise they may be involved in, and also the needs of the office. We were able to make that marriage when I came to do my internship because I was really still in the academic mode and that is what determines how useful an intern is for an office and what the intern gets from the experience. Q: As an intern, did you think you wanted to be in Congress? A: That wasn’t even my thought because I was a government and public policy major at Oberlin. I was really more interested in the mechanics of how things get done on the Hill and so, at that stage, I knew that I wanted to be involved in public service. I just didn’t know how that would manifest itself in the long run. Q: Does the fact that you were a former intern affect the way that you work with your staff? A: Absolutely. I tell my staff all the time, there’s no tricks of the trade that you can engage in that I haven’t been there, done that. I really, to a large extent, leave it to the management of the office to make sure that all of our subject matters are covered, in terms of our committee assignments [and] that we have sort of a collaborative process around ways in which we engage, not only here on the Hill but in the district. I think it’s the leadership of the office — chief of staff, the district director — that ultimately set the tone for how productive we can be.